Heat oven to 350°F. Grease bottom only of 10-inch springform pan with shortening. In large bowl, beat all base ingredients 50 strokes with spoon. Spread in pan. Bake 35 to 40 minutes. Cool completely, about 1 1/2 hours. Meanwhile, in medium saucepan, place 2 tablespoons water; sprinkle gelatin over water. Let stand 1 minute to soften. In food processor bowl with metal blade or blender, place strawberries. Cover; process until smooth. Add to softened gelatin; mix well. Cook over medium heat until gelatin is completely dissolved. Cover; refrigerate until mixture is slightly thickened, about 1 1/2 hours. In large bowl, beat whipping cream and powdered sugar until stiff peaks form. Fold in strawberry mixture. Spoon over cooled brownie base. Refrigerate until set, about 2 hours. Just before serving, garnish torte with chocolate curls, straberries, and mint leaves. Store in refrigerator. Ring in the New Year with this smashing dessert. 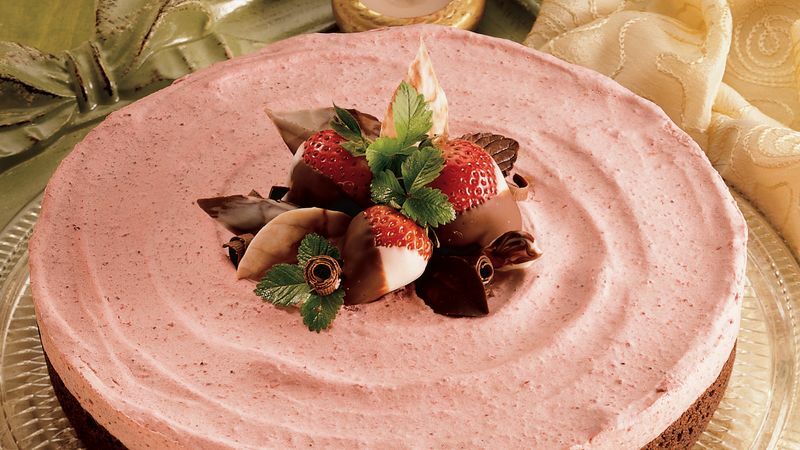 For another garnishing idea, how about dipping whole fresh strawberries into melted chocolate and arranging them on top of the torte?